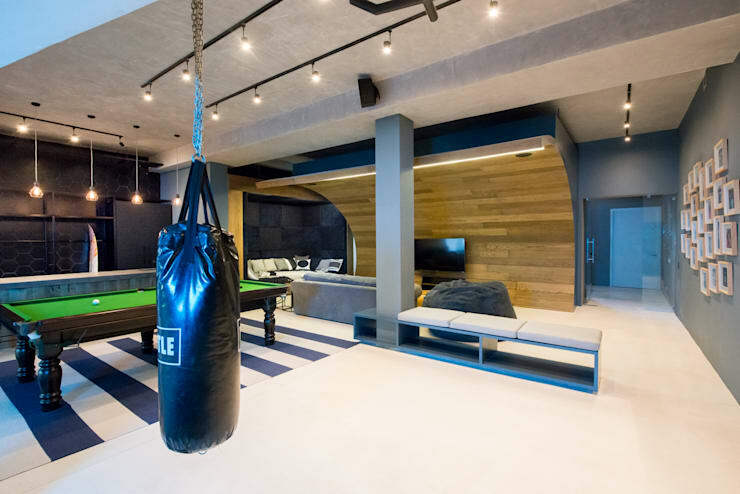 WHEN INHOUSE BRAND ARCHITECTS WAS ASKED TO CONVERT AN UNUSED ROOM INTO THE PERFECT TEEN HANG OUT, THEY DIDN’T DISAPPOINT… INTRODUCING THE ULTIMATE URBAN MAN CAVE! 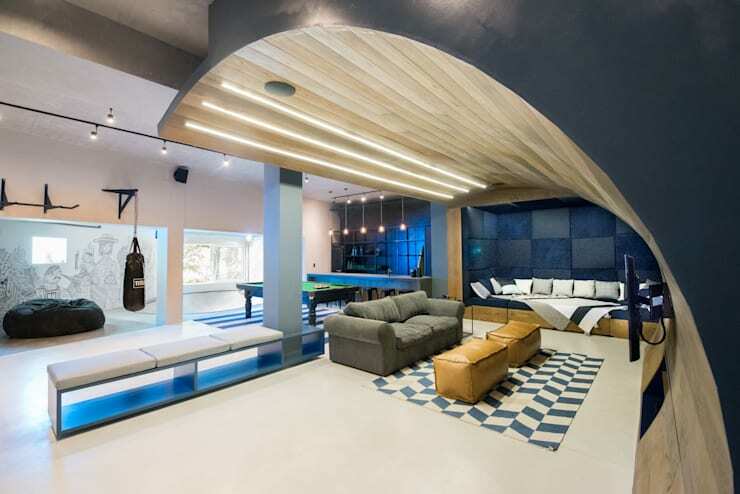 What can only be described as the ultimate “man cave”, Inhouse Brand Architects has converted the unused lounge area of a Cape Town residence into an industrial-inspired dream pad for the family’s lucky teenage boy and his friends. 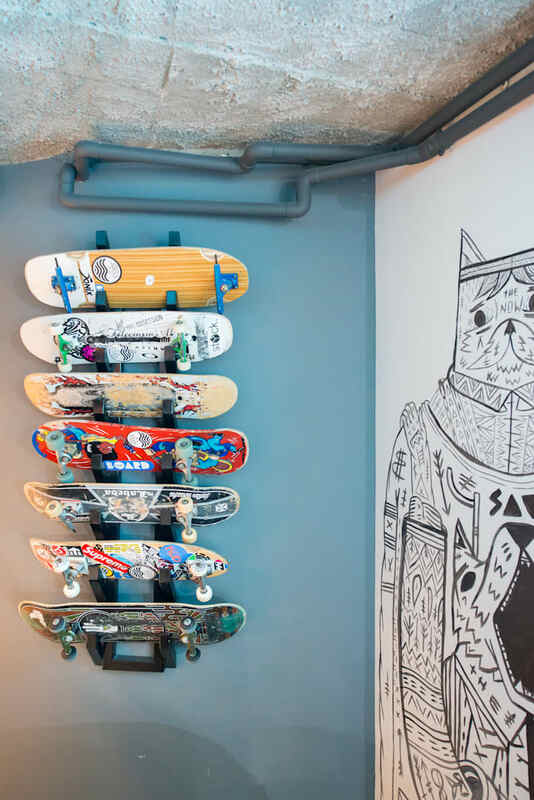 Taking into account the youngster’s various interests such as skating, surfing and socialising, the Inhouse team aimed to create a trendy, multifunctional space. The project was steered by Creative Director Aidan Hart, and senior designer Jenine Bruce, who chose a modern industrial aesthetic for this youthful interior. 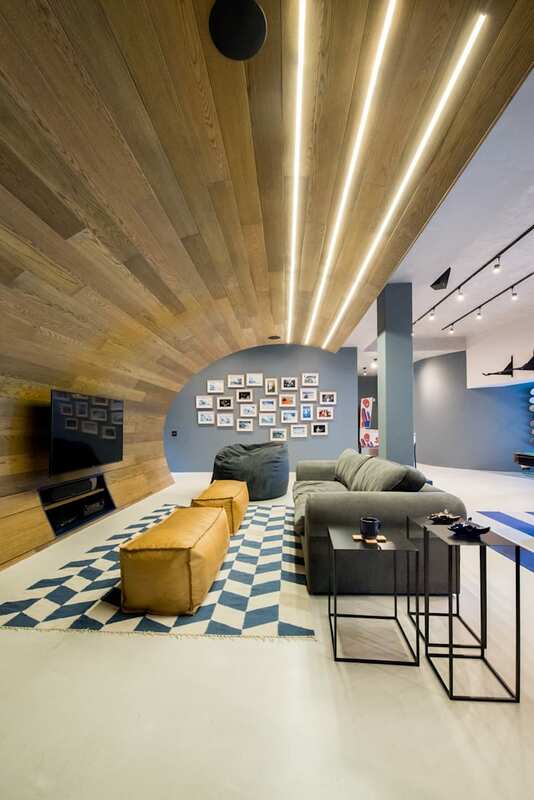 Polished concrete flooring encompasses the entire room and sets the foundation for the interior scheme. 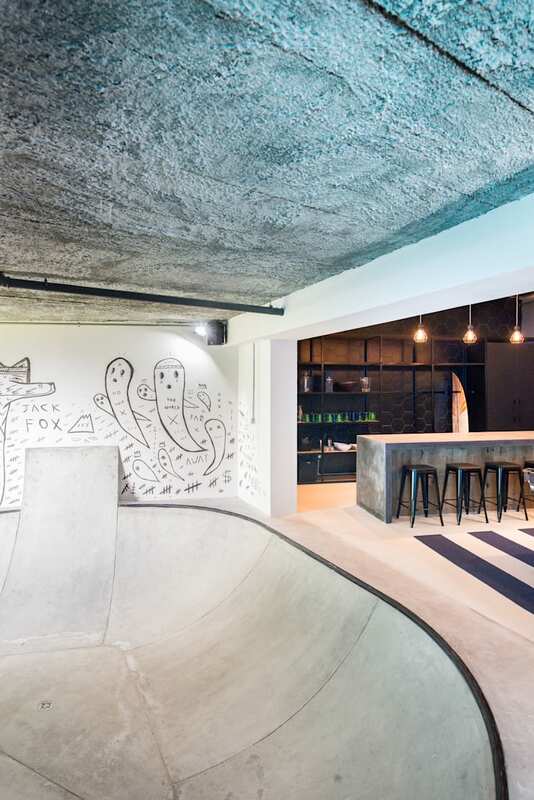 More notably, a fully functional concrete skate bowl plays a major part in the design. This impressive structure was no easy feat. Initially, the bowl was supposed to be built in a stepped down recess, but after realizing that the structure would be too unstable to support the weight of the framework, Inhouse had to come up with an alternative solution. During a six-week process, a revised plan was put into action. An entire floor level was removed; timber fins were crafted in the newfound space to create the frame; flexible plywood and polystyrene were incorporated to shape the backing; sand and rubble were used to fill the level that was taken out; and finally, cement was poured into the structure to solidify the bowl shape. 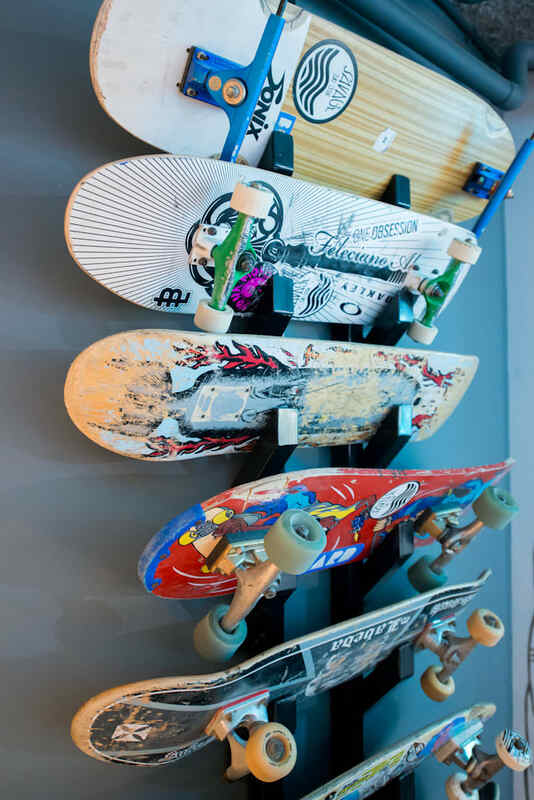 Although the process took longer than initially planned, the end result is a deeper and more functional skate bowl—one that will most certainly keep the teen and his friends entertained for hours! To embellish this remarkable feature, emerging South African street artist, Jack Fox, applied his signature illustrations to the walls surrounding the bowl. The celebrated artist worked without a set design and completed the impromptu artwork in a twelve-hour, non-stop operation. 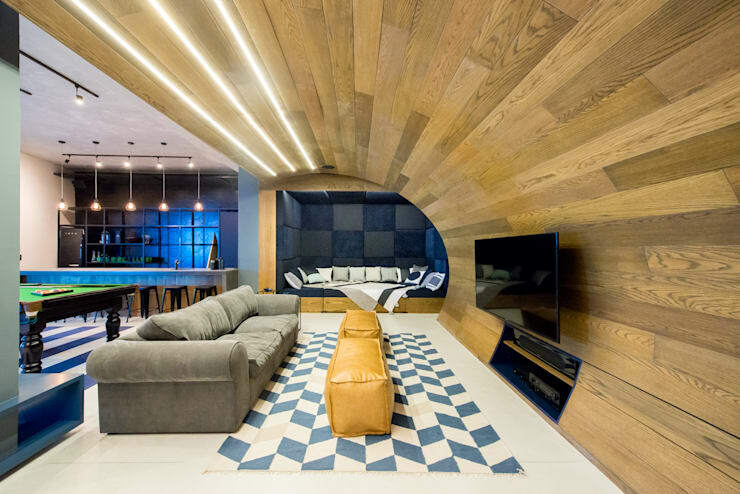 Another striking design feature comes in the form of a grandiose, curved timber wave that cascades from the ceiling down to the floor to create an extraordinary zone for watching movies. This “wave” is crafted out of steel fins that are clad with timber and lit up with three LED strips. It is kitted out with surround sound to produce a genuine movie theatre experience. 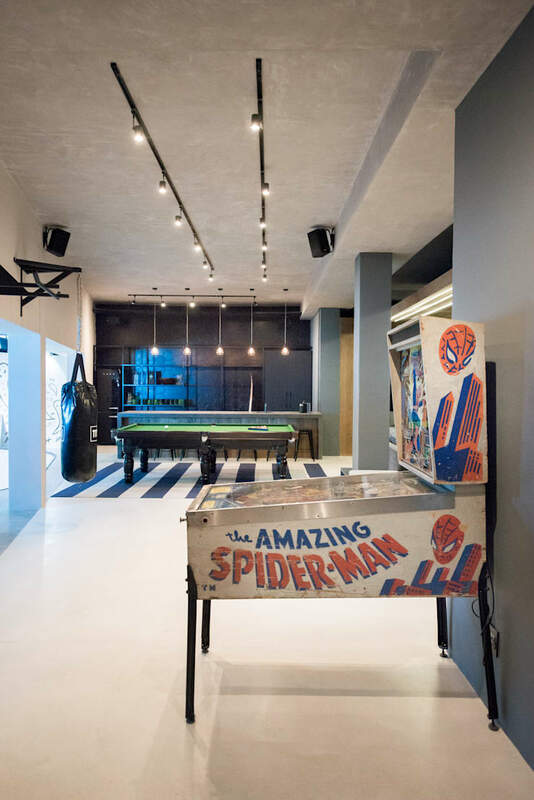 The bar area comes equipped with a stylish black Smeg fridge and cleverly positioned surfboard rack, which is not only a functional feature but also displays the seventeen-year-old’s most prized possession. The bar itself, which measures four and a half metres, is fashioned from ground and polished concrete, perfectly matching the flooring. Clad with timber, the bar exudes a robust masculinity. Next to the bar and adjacent the timber wave is comfortable booth seating. Framed with timber and upholstered in inviting shades of indigo, this nook provides an enticing ‘chill’ spot. Industrial track lighting is installed throughout the space. Soft LEDs are embedded overhead in both the booth seating area and the timber wave, to create ambient lighting. 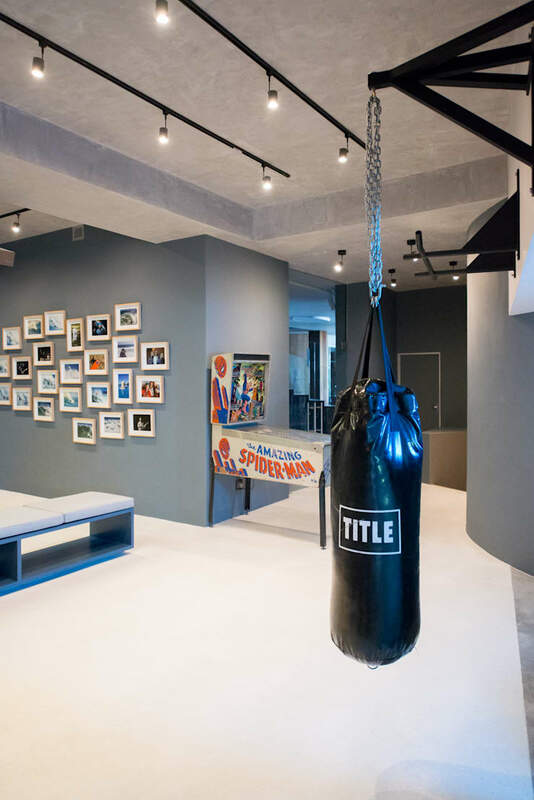 Lastly, steel cage pendant lights are suspended over the bar and contribute to the room’s urban-like aesthetic.